SWOT is short for Strengths, Weaknesses, Opportunities, and Threats - four key factors to evaluate an organization's present performance. They constitute the four components of a SWOT Matrix - a tool used to measure an organization's competencies and identify opportunities. It is widely believed that SWOT Matrix is a recipe for success in the highly competitive market. This analysis is done as part of the overall corporate planning process. It will be helpful for achieving financial and operational goals set for the next year and creating strategies to accomplish these goals. In all companies, resources are finite, including the work force, production capacity and capital. 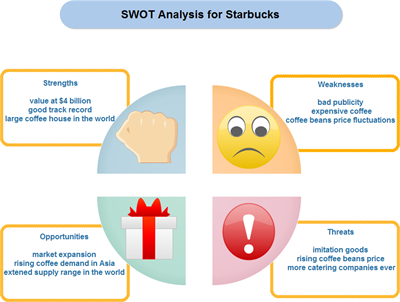 Maximizing the value of limited resources is one of the main reasons to use SWOT Matrix. It requires a detail analysis of what have the company got; what have been made most of and what are valuable but have been neglected. Thus, it helps to determine how to allocate these resources in an efficient way that will result in the highest potential for revenue growth and profitability. No progress sometimes means lagging behind because others keep improving. Seeking out the backward and weak sides is the first step to move forward. Then SWOT Matrix offers a visual way to find out the most critical fields that need to be advanced and compete more effectively. Just like beauty is in the eyes of beholders, chance favors only the prepared mind. We offer not just examples, but creative and impressive examples. Without earnest observation and detail analysis, opportunities cannot be found out and taken advantage of. SWOT analysis is conducive to both discovery of emerging opportunities right now and forecast of longer term chances. Therefore, advance planning can be made to get ready for the mature time to enter market. Threat in SWOT analysis means risk, which has negative impact on performance. If contingency plans are prepared and implemented in time, risk can be less threatening. SWOT is just the right way to take precautions. Besides usage in business corporations, SWOT Matrix can also be applied by other areas like individuals for personal improvement, communities for better management and broader society for better environment. For example, it can lay a foundation for knowing themselves better for those who are expecting to climb the career ladder. If you are one of them, you may be interested in this article: Conduct an Individual SWOT Analysis with Ease. Edraw provides not just general example, but creative example, embedded in the software and ready for use. Check out one amazing example. Try Edraw yourself and you will get more than what you see. As shown in the picture, its interface is well-organized so that it can be understood at first glance. If you want more SWOT matrix examples, please visit this page. To be more vivid, you can add clipart just within the software. 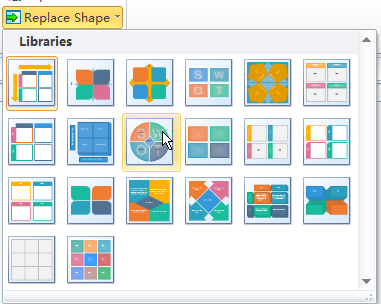 If you don't like the shape, you can replace it with any one of the 5 SWOT shapes from the library. With only 3 steps, done. 1. Select the shape. A green box appears when the shape is selected. 2. Click Replace Shape on the Home menu. 3. Choose the SWOT shape you prefer. If there is a shortcut, why bother wasting time and money? The shortcut is right here with Edraw, starting from a template rather than from scratch. Pay a little attention to it, and you will be repaid enormously. 1. 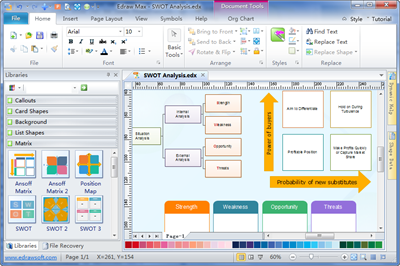 Start Edraw; click SWOT Matrix in Template Categories list. 2. Move the pointer downwards to the Example list and double click on one SWOT Matrix Example to open it. 3. Replace the text in the diagram with your own content. 4. Click on your preferable theme to change its look. 5. Save it or export it in other formats including Word, PDF and PPT. 1. The drawing process has been saved so you can focus on analysis. 2. Quick change of appearance by applying themes. 3. More choice of templates including 3D Matrices. 4. More flexible presentation with editable results even in full screen-play. 5. Complete integrity with MS Office enables better collaboration and team-work. 6. Auto saving eliminates your worries of file loss in case of computer dysfunction or power shutdown.